Launch of “Zero Hunger Challenge” Campaign with Jan Eliasson, Deputy Secretary-General of the United Nations. Timor-Leste, Asia-Pacific’s youngest country, today became the region’s first to launch a national campaign under the United Nations Zero Hunger Challenge, which seeks to ensure universal access to food in the face of looming threats such as climate change. “Working together, hunger can be beaten and the developing countries of Asia and the Pacific, with the support of our development partners, are taking the lead in making hunger history,” said Ms. Heyzer, who is also Secretary General Ban Ki-moon’s Adviser for Timor-Leste, which the UN shepherded to independence in 2002 after it voted to secede from Indonesia. Mr. Ban launched the Zero Hunger Challenge in 2012 with the goal of creating a future in which all people enjoy their fundamental right to food, and where livelihoods and food systems are resilient enough to withstand multiple shocks, including the impacts of global climate change. Its five specific objectives are to make sure that everyone in the world has access to enough nutritious food all year long; end childhood stunting; build sustainable food systems; double the productivity and income of smallholder farmers, especially women; and prevent food from being lost or wasted. Asia and the Pacific saw the regional launch of the Challenge at ESCAP’s 69th Commission session in Bangkok last April but Timor-Leste is the first country to pilot the creation of a national action plan. 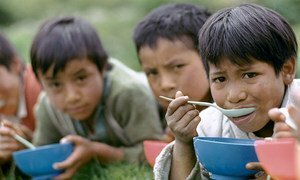 According to the preliminary results of a new study in Timor-Leste, malnutrition rates have been significantly reduced from about 44.7 per cent in 2010 to 38.1 per cent last year, with chronic malnutrition in infants under 23 months reduced from 49 per cent to 38 per cent. But much work remains to be done as more than 50 per cent of children under five - almost 100,000 - are still stunted, according to the UN Children’s Fund (UNICEF). “As the Secretary-General’s Special Adviser for Timor-Leste, I am very pleased and proud that the first national launch of the Zero Hunger Challenge campaign in Asia and the Pacific is being hosted here today in Dili,” Ms. Heyzer told the inaugural ceremony attended by Prime Minister Xanana Gusmão. “It is another demonstration of the Government’s commitment to addressing the urgent and very real challenges of hunger in Timor-Leste. United Nations officials are marking Human Solidarity Day today by calling for joint action to reach the globally agreed goals of reducing extreme poverty, hunger, disease and other social and environmental ills by 2015, and to create a more sustainable future for all.